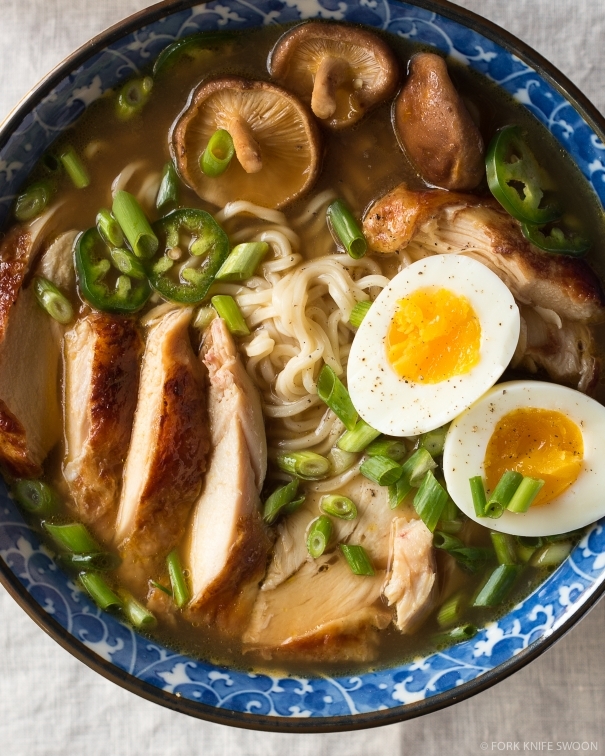 Easy homemade chicken ramen, with a flavorful broth, roasted chicken, fresh veggies, lots of noodles, and a soft cooked egg. Inspired by traditional Japanese ramen, but on the table in under an hour. The Honey’s parents are American ex-pats living abroad in Tokyo, Japan, and while visiting them over the last seven or eight years, he’s collected dozens of favorite eateries throughout the city. There’s the best izakaya in Kichijoji, serving up casual Japanese pub food, and countless kiten-zushi restaurants, where my English-speaking Honey can choose small plates of freshly-made sushi from a moving conveyor belt without having to order in Japanese. He always makes sure to buy at least one Pocari Sweat from a vending machine (think Japanese gatorade), and of course, there’s his favorite ramen shop in Shinjuku, a tiny, crowded restaurant with a line out the door. Paintings of pigs adorn the walls, and big, steaming bowls of pork ramen are served to hungry patrons at a single bar counter. Real Japanese ramen, the kind that my Honey tells stories about, takes years and great skill to perfect. 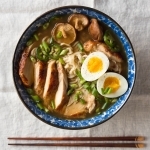 I wanted to create a simple ramen noodle soup that reminded him of Japan, but could be made quickly, with ingredients on hand. I opted for chicken instead of pork, but kept the rest of the ramen vibe somewhat traditional: a killer chicken soup base with garlic, ginger, shitake mushrooms and soy sauce, filled with squiggly ramen noodles and slices of succulent chicken, and topped with fresh spring onions and a soft-boiled egg. My version is on the table in less than an hour – and half that if you opt for store-bought chicken – and while it might not be completely authentic, it’s a flavorful, comforting soup just in time for the unmistakably crisp, chilly autumn weather that these first days of October have ushered in. Cook the chicken*: Preheat the oven to 375 degrees. Season the chicken generously with salt and pepper. Melt the butter in a large oven-safe skillet over medium heat. Add the chicken, skin-side down, and cook until the skin is golden brown and releases easily from the pan, about 5-7 minutes. Flip the chicken over and cook for another 4-5 minutes, until golden. Transfer the skillet to the oven and roast for 15-20 minutes, until the chicken is cooked through. Remove from the oven, transfer the chicken to a plate and cover with foil until ready to serve. Make the ramen broth: Heat the oil in a large pot over medium heat, until shimmering. Add the garlic and ginger, and cook for a few minutes until softened. Add the soy sauce and mirin, and stir to combine. Cook for another minute. Add the stock, cover, and bring to boil. Remove the lid, and let simmer uncovered for 5 minutes, then add the dried mushrooms. Simmer gently for another 10 minutes, and season with salt, to taste. Assemble the ramen bowls: Meanwhile, chop the scallions and jalapeño (if using). Slice the chicken into thin pieces. Set aside. When the eggs finish cooking, add the ramen noodles to the boiling water. Cook for 2-3 minutes, until soft, then divide the noodles into two large bowls. 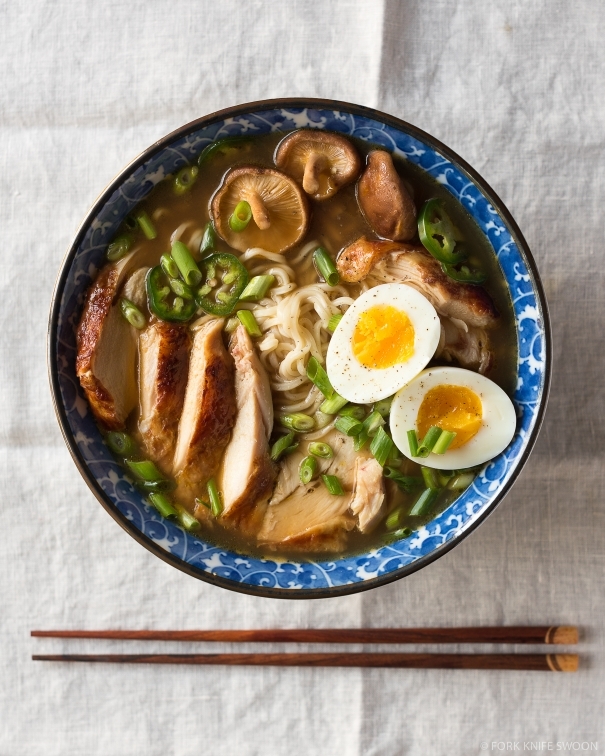 Add the sliced chicken and the ramen broth. Top with the fresh scallions, jalapeño and the soft boiled egg. Serve immediately. Ask your butcher to remove the rib bone from the chicken breasts (leaving the skin on), or use bone-in, skin-on chicken breasts and increase the oven roasting time 5-10 minutes, as needed. You can also cut your ramen prep time in half by using a store-bought whole rotisserie chicken, simply slice off as much as you wish, and add to the ramen. 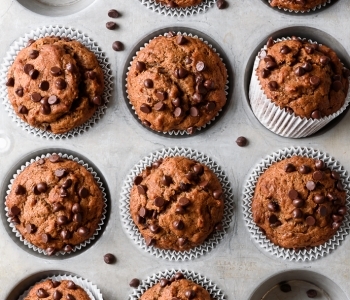 Super easy to make and super tasty. Not sure how healthy / unhealthy it is tho. 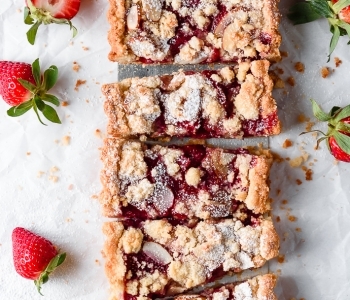 Hello, I just have to say that this recipe is amazing. Thank you! I waited for a nice cold day and it warmed me up. this is definitely comforting food at its finest. Made this today and my family loved it (even my 3 year old). This was my first time trying Ramen and I’m very impressed! The only thing I didn’t do was the eggs. (To be honest I did cook the eggs but mine didn’t cook enough in the 8 minutes , I’ll try them again next time and make an extra tester egg. 😊) Thank you for this delicious recipe! 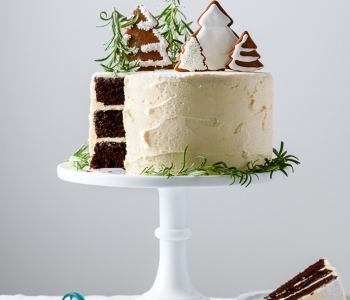 I typically never comment on recipes….but I just had to say something about this one. We make it at least twice a month, it is the go to comfort food in our house. The only thing I changed was fresh mushrooms, bok Choy, and some Sriraca and sesame seeds on top. This is now a go-to recipe for me. It tastes just as delicious as restaurant ramen. SOOO yummy. Do you know what the sodium content is for this recipe? I am in search of a great Ramen recipe with not the ton of sodium for my 90 year old dad who LOVES Ramen! We have some great Ramen in hawaii but all with great amount of sodium! Loved this recipe so much. 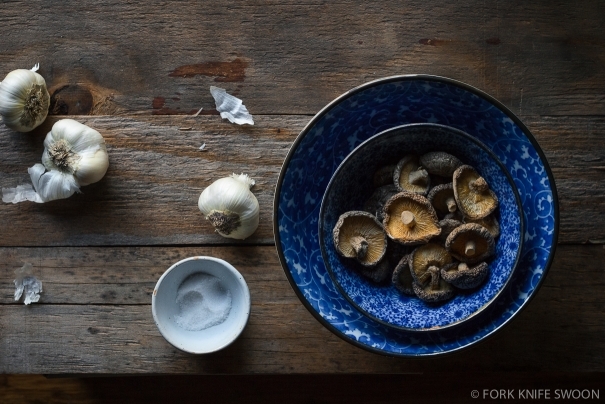 Fresh mushrooms worked better than dried, but otherwise we loved this recipe. Did take more like an hour but perhaps with practice….. Loved this recipe, tried it last night I didn’t add butter and I used skinless chicken breast instead (weight watchers) I also doubled the amount of chicken and eggs to make 4 servings verses 2, so came out to around 6 points total which is not bad for a dinner or lunch recipe. But it was fantastic, fresh and even better leftover! Everything had a chance to marinate and combine the next day and it was a wonderfully flavorful hot soup for a cold, snowy Pennsylvania day! Thanks so much for sharing! How do you prepare chicken stock? This is SO delicious! 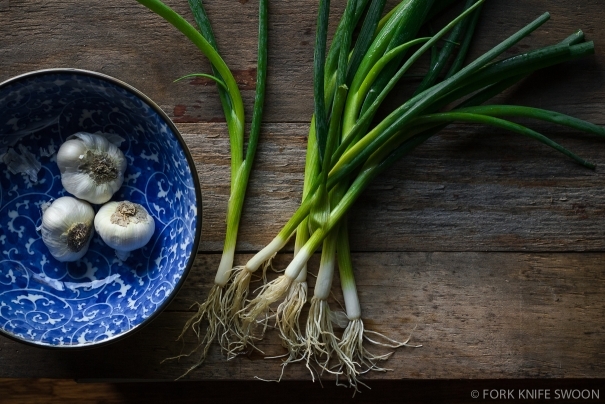 I can’t believe how simple, yet flavourful this soup is! 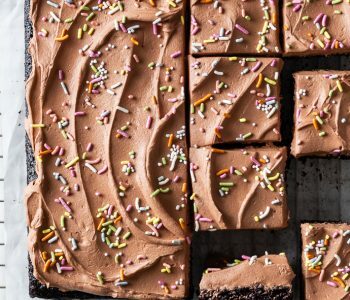 I have made this a few times now, and it has become a staple in my house! Thanks for a great recipe! This is seriously one of the best meals I’ve ever tried! I was very skeptical about trying this recipe because it is very simple and i thought maybe it would lack in depth of flavor. It definitely doesn’t lack in flavor, and the ingredients are affordable. I loved this dish so much i went back the next day to get more ingredients for a double batch. I followed this recipe exact and didn’t change anything, it is perfect. Thanks so much! I have made this recipe a few times now and love it. Heather, how much miso did you add to the recipe? Nicklaus, sorry I’m just seeing your question. Since I use instant miso I use enough for one serving and that seems to do it. So if you’re using paste I think use enough for one serving as well which may be like a tablespoon. Tweak to your liking!